Arsenal de Sarandi held off River Plate in normal time before two Mario Cuenca saves in the penalty shootout secured Arsenal a 4-2 victory and a place in the Copa Sudamericana final. Cuenca himself even dispatched the winning spot kick; a fitting end to a game where the Arsenal defence was rarely breached and when it was, Cuenca was on hand to bail them out. Arsenal actually created the better chances in the game, the first after three minutes, when Leonardo Biagini hit the crossbar with a powerful shot that had Juan Carrizo in the River goal beaten. In the second half, Sebastian Carrera found himself one-on-one with Carrizo but could only fire over. Fernando Belluschi proved to be the main threat to the Arsenal goal, going close with an early effort and having two second half shots saved by Cuenca. An injury to Ariel Ortega after twenty-one minutes left River slightly toothless up front and they struggled to make much of an impression on their opponent's goal apart from Belluschi's efforts. River's Oscar Ahumada was sent off for serious foul play five minutes from time, but still there was no breakthrough in the remaining minutes and the match went to penalties. The first four penalties were all converted; Jose Calderon and Javier Yacuzzi for Arsenal; Rolando Zarate and Paulo Ferrari for River. Carlos Castiglione put Arsenal 3-2 up, before Cuenca saved from Rene Lima. 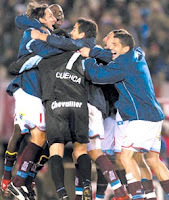 Cuenca successfully converted the next penalty himself and then saved from Belluschi to clinch the victory for Arsenal. Arsenal will now take part in their first ever Continent-wide final against America of Mexico over two legs, with the first leg to be played in Mexico on the 28th November. Defeat for River surely spells the end of Daniel Passarella's time in charge of Los Millonairos, with Argentine sports paper Ole leading with the headline 'Passa Is History' this morning. He promised to bring silverware to River by the end of this year and has failed to deliver. They will now begin to search for a new coach, in the hope of finding someone who can bring a trophy to the club for the first time since the 2004 Clausura.